heute zeige ich euch meine neuste Lawn Fawn - Mama Elephant - Kooperation :) Ich habe kürzlich das Set Baked with Love von Lawn Fawn bekommen und musste es gleich ausprobieren. 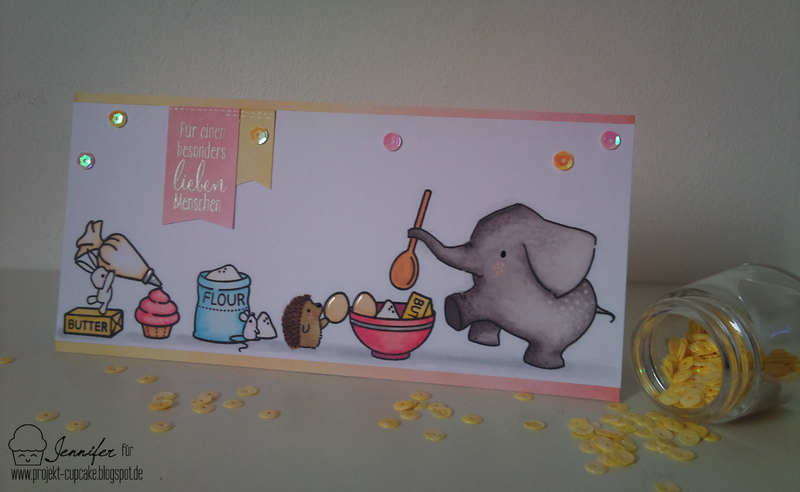 Daneben lag mein Mama Elephant Set Ella & Friends und der kleine Hase sah so aus, als wollte er unbedingt Cupcakes mit Zuckerguss dekorieren :D. Auch Ella selbst und ihre anderen Freunde fanden eine Aufgabe in meiner tierischen Backstube. Trotzdem ist die Karte doch im wahrsten Sinne des Wortes echt süß geworden, oder? today I would like to show you my latest Lawn Fawn - Mama Elephant - Coop :) I recently received the new Lawn Fawn set Baked with Love and wanted to combine it with the cute Ella & Friends (Mama Elephant). The little rabbit was almost begging to put the frosting on the cupcakes. And Ella and her other friends found a job in my animal-managed bakery, too. To create the card I used a whole lot of masks for the stamping part and finally coloured everything in with my alcohol based markers. The sentiment was the hardest part to be honest. At last I chose "For a very special person". Oh My Goodness! Your card is super clever! I love everything about it. Thanks for joining us at Little Red Wagon this week! Waaah, ist das eine süße Karte - Hammer!